This is a required core class for all first year graduate students in our MFA program. It's basically just about spending more time making games in groups. Hopefully these practice projects prepare them better for the thesis process in their second year! I usually teach more undergraduate students than graduate students, so it'll be fun to adapt my teaching style to this older demographic. It's also a huge class, with more than 30 students; we usually cap most Game Center classes to 16 students because we have such a hands-on, one-on-one teaching approach, but here it's important for the whole cohort to get to know each other. It's going to be a big challenge to scale my attention to a class that's basically double the average size, and I think I'm going to have to tweak a lot of my methods. We'll see what happens. This year during GDC, I'm happy to be participating in DELETE GDC, a big party where you can play a bunch of new never-before-seen games... that will be deleted by the end of the night. At past DELETE events, that ephemeral quality has meant a lot of unique performance-type experimental games, like a drinking game where the designer/performer gets blackout drunk for the first time in his life, thus "deleting" his memory / life... or a game about offering your secrets to an altar before ritually burning them. This is the first DELETE being held outside of Australia, and I'm excited to be working with Louie Roots and the rest of the artist lineup: Natalie Lawhead, Ramsey Nasser, Leura Smith, Zachariah Chandler, and Kaho Abe. As for my contribution, my first thought was a game about literally deleting GDC from existence -- erasing every trace of UBM and Moscone Center from the universe -- but then it felt too depressing to see that deletion get deleted and undone at the end of the night. Also I felt it was important to go with the golden rule of game jams: never go with your first idea. So now I'm aiming for something different and more communal: a fairly involved installation piece about game development and labor, a sort of "human game engine" thing. Hopefully I'll figure it out over the next two months. GDC veterans will note that this event falls on the same night as, traditionally, That.Party... but don't worry, you're allowed to attend more than one party in one night. In fact, it's probably best practice. 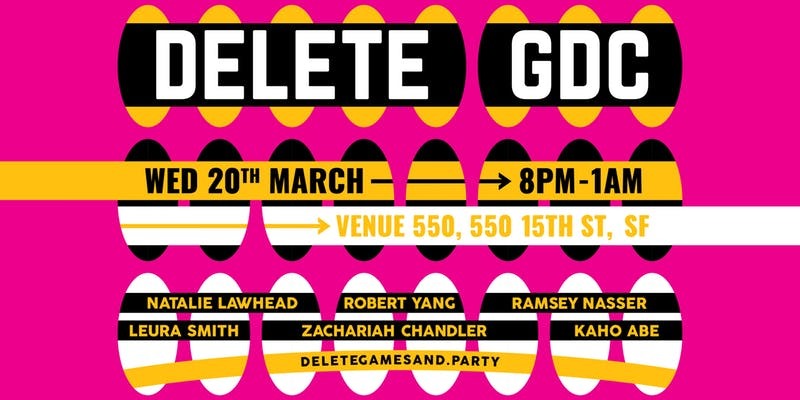 Delete GDC runs 8 PM - 1 AM on Wednesday, March 20th, 2019 at Venue 550 in San Francisco. Tickets are $30 USD. Finish and release my cam stripper sim game MachoCam. In contrast to 2018, I want to try focusing on a bigger release in 2019, instead of playing with many smaller projects. This bigger release might also be my first serious IGF submission for 2020. I'm sure I'll go back to smaller works after I get this out of my system. Make 1 visual novel. The visual novel has become the video game equivalent of the romantic comedy, and I've decided I want a piece of the action. Writing a dialogue-heavy work will also help me "dogfood" my own narrative tools. I might pair it with my old gay Go AI prototype, which makes sense in my head for some reason.